Gary Forman, a past RGHDS board of trustess president, and his wife, Marsha, a school nurse, take in the news the school will close. Virginia Feldman stood before the crowd in a room that serves as Reuben Gittelman Hebrew Day School’s gym, cafeteria, and auditorium — a room that had staged middle school plays, siddur and chumash ceremonies, basketball games and graduations. As president of Reuben Gittelman Hebrew Day School’s board of trustees she had to deliver news no one wanted to hear. The school was in dire trouble. And the board, she said, had searched for a solution, explored mergers, looked at different models for a smaller school, started enrollment campaigns, a capital campaign and worked to make a go of it. But declining enrollment, primarily, and a poor economy on top of that, had left board members no where to turn. There was “no solution present that would help us remain a sustainable, viable school. And again we have looked at many options,” she said to about 200 parents, board members, teachers, school administrators and community leaders. After 40 years of operations — 20 at the building on New Hempstead Road — the school that began at the JCC of Spring Valley, a large Conservative congregation that also has since folded, will cease operations. For the non-Orthodox part of the Rockland Jewish community that prides itself as non-insular, it is another blow. In the past decade Conservative and Reform synagogues have closed or merged. The loss of the Gittelman school is just another reminder of shifting demographics in the county and changing priorities among Jews nationwide. “We just couldn’t bring kids in,” said Gary Forman, a former board president. Twenty eight years ago, he and his wife, Marsha, attended a Saturday night welcome program when the school was still the Solomon Schechter School of Rockland County to see if the school was the right one for their son, Brian. They never left. Gary remains on the board today and Marsha served as a nurse at the school for nearly 20 years. And for all those intimately associated with the school, whether educators, parents, founders or students the school was family. “That close knit family, that was my grade,” said Isabel Malmazada, who graduated from RGHDS in 2010 and is now a sophomore at the Solomon Schechter High School of Westchester. Milton “Milt” Gittelman got involved at RGHDS in the first of second year of the school’s existence when he enrolled his twins there. At the time, it was located at the JCC of Spring Valley, then the largest Conservative congregation in the county, located on Route 45. The school was small, but growing. As the school grew in numbers, it outgrew its location. By the time Forman enrolled his children, the school had moved to Summit Park Elementary School on Route 45, and was paying $45,000 in rent to the East Ramapo Central School District. In 1986, the school district wanted use of the Summit Park School, and the system offered the school — by this time was known as Reuben Gittelman Hebrew Day School — the Bluefield Elementary School for $60,000. The Yeshiva of Spring Valley, however, blocked the deal, suing the East Ramapo Central School, according to court documents. At the time, Gittelman had 327 students, 40 percent of whom came from the East Ramapo school system. In the end, in a closed bidding process, RGHDS won the lease, but the rent skyrocketed to more than $200,000, according to Forman. “We walked out of the room and we said ‘Never again, we can’t let anyone else control our destiny,’ and that’s when we decided to build our own school,” said Forman. Arnie Garelick and Uri Sasson, brothers-in-law, owned a piece of property on New Hempstead road near the Palisades Central Parkway at exit 11. They sold the property to the school at cost. Sasson, whose name graces the entry way of the school today, literally built the school at no cost “calling in every favor he could,” said Forman. 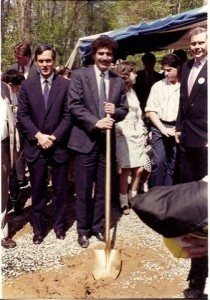 Uri Sasson, the school’s builder, gets ready to break ground in 1991. 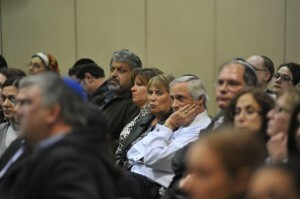 For Sasson the school closing was almot like losing a family member. He’s been involved since his oldest child started kindergarten 28 years ago, and all four of his kids attened. His wife, Sharon, was a PTA president and even after his children graduated, she continued helping out in the school, mounting the middle school musical each year for 16 years. “For those of us who were very, very involved, we saw the school as something that provided Jewish continuity and community,” said Sasson. “That need for a non-Orthodox school, it was extremely important to us, to provide such a place that would give the highest general and Jewish educations. But Gittleman did something extra, he noted. It educated and molded parents, as well. The groundbreaking that bright May day was giddy with expectation; Garelick and Sasson and their wives, Sue and Sharon, symbolically broke ground surrounded by hundreds of people. “Within two years, we moved into this wonderful school,” said Forman. A decade ago, Gittelman had nearly 350 students enrolled. As Feldman pointed out in the community meeting, even two years ago there were 250. Today there are about 150, and the board did not see anyway to open, she said. Each student in kindergarten through 8th grade represents roughly $15,000. Every 10 students lost is another $150,000 missing from the operating budget. The rate of attrition was exacerbated by the economic downturn in 2008; but the shrinking classes pose a further problem. Parents see small classes as warm and nurturing, but too small classes mean that a child has a limited social group. Board of Trustees President Virginia Feldman addresses the crowd. Small classes are also indicative of something else. There have been shifts in the non-Orthodox streams of Judaism during the past decade, not just in this county, but across the country. The Conservative movement, once the nation’s largest with its sense of traditional worship that met the needs of a modern, post-World War II population, has contracted. In less than a decade, the number of Conservative synagogues has dropped from 800 to 650 nationwide, representing a 14 percent drop in overall membership according to a survey done earlier this year by United Synagogue of Conservative Judaism, which represents Conservative congregations. That disinterest is a pattern reflected in Schechter day school numbers. The AviChai Foundation, which tracks day school enrollment, saw only a modest decline of 1.4 percent in the number of such schools for the past school year. But the sharpest decline was among Solomon Schechter schools of the Conservative movement, of which Gittelman is one, which saw student enrollment decrease was 3.8 percent, from 11,786 students in 2010 to 11,338 this past year. There were 43 schools represented, down one from the previous year. In 1998, when the organization first began tracking enrollment, there were 63 of Schechter schools, with 17,563 students enrolled. Whether Gittelman will be joined by any more closings this year remains to be seen, according to Marvin Schick, a senior advisor for the AviChai Foundation. But he expects that the coming year will see more. Non-Orthodox day schools don’t have a prayer unless they are rethought from the ground up, with endowments and endorsement of government funding for private education, he said. Philanthropists and family foundations tend to prefer funding bricks and mortar to ongoing support, he said. “Let me put it this way, very briefly, day schools have to come to the realization that they are no different than other institutions like hospitals and universities,” Schick said. “They have to build up their endowments….Those that don’t will not be able to weather storms. And those that do, will be able to. Elyssa Koenig, a parent of one RGHDS graduate and three current students, make a teary testimonial to the school – and for parents not to blame the Board of Trustees. Anne Katz nurtured and taught generations of RGHDS kindergarten students, first coming to the school in 1976. She loved teaching at the school, where children came from homes were learning was highly prized. 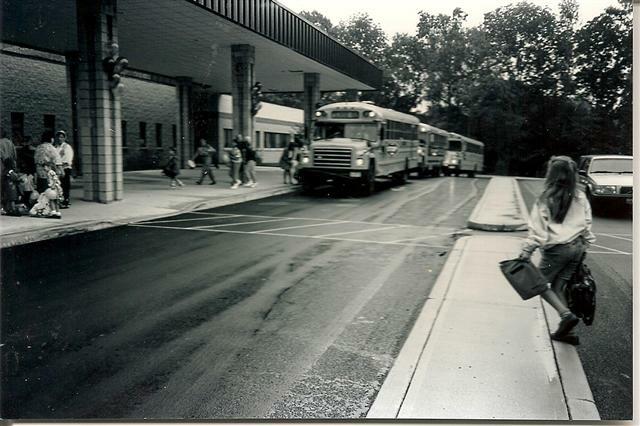 The first day of school at the New Hempstead Road building in 1992. She was on sabbatical this year and in Israel when her daughter called her with the news that the school had closed. For her, the school was home, helping strengthen her own Jewish identity, as she aided young children with theirs. The school had reached beyond its walls, she said, influencing the wider Rockland Jewish community. She is not alone. Claudia Warter also came to the school 36 years ago. Her daughter attended as a student, as did the children of Edna Pasternak, who has been teaching 1st graders for 31 years. Both said that Gittelman was more than some place to work, that it felt like family. “Some of us really had our heart in it,” said Warter, who always referred to the students as “my kids,” even when her own children corrected her as to who were really her kids. “This was my home away from home, my family away from family,” she said. Pasternak is taking the blow very hard. There are many broken hearts in the Gittelman community. Parents are struggling with the loss of the school while trying to figure out educational options for next year (see related story). Rabbi David Berkman, also of NCJC, has benefitted personally from the school’s presence, having three children who are graduates from the school. His youngest, Chana, is currently enrolled. Losing the only non-Orthodox educational option in a community as bifurcated between the Orthodox and the not as Rockland adds an “extra twist,” he said, to the all-too-common tale of failing Schechters. Gittelman, he said, provided his children with an intense sense of their own “kids’ community” and Jewish pride. That tight sense of community, of being a family was what those “Gittelman kids” found special. When asked what she got out of Gittelman, Rachel Soffer Parritz didn’t hesitate. And when she heard about the school closing, it was those best friends who commiserated. Parritz, who was in the first kindergarten class in the New Hempstead Road building, received a stellar Jewish education and one that helped her think critically and use those tools in college and beyond. “I got a strong sense of Jewish values in every part of my life,” says Parritz, who graduated in 2001. David Strinkovsky, who graduated in 2008 and currently attends the Solomon Schechter High School of Westchester, heard the news and immediately called his former Gittelman classmates, spending hours on the phone reminiscing and wondering how it would affect the future. “Gittelman, like building a house, gave me a foundation,” said Strinkovsky, whose younger brother is in third grade at RGHDS. “It gave me the foundation I needed in almost everything I do, whether it be in leadership in USY [United Synagogue Youth], math ability, English, writing, it was a place to get what you wanted to trigger the engine. The community meeting ended with a question and answer session as President Virginia Feldman’s words sunk in. Parents were saddened by the news and angry that the board had not somehow clued them in sooner. They were also invited to a meeting immediately after to hear about a new school, the Rockland Jewish Academy, for pre-kindergarten through fifth grade, starting at the Rockland Jewish Community Campus. Feldman, who has served on the board since the 2008-2009 school year, became president in July. At that point she did not realize the school was in such a difficult position. “I didn’t think the school was going to close at all,” she said. She and the board spent the last several months trying to find a way to prevent that. But without more incoming children, the situation was unsustainable. In the coming months, the board has to move through the legal process of closing Gittelman and changing its charter, said Feldman. Board members hope to sell the building and use the funds, once they pay off the mortgage and all other contractual obligations, to provide financial aid to students who wish to continue their Jewish studies in day schools. There are details to contend with. What to do with the plaques and dedications on the walls. How to pack up the memorabilia and memories. The school plans to wind up the year, its 40th, with a celebration, said Feldman. There has to be some way to honor the past, without it feeling like a funeral. Feldman herself is trying to figure out what to do with her 7th and 3rd grade children for next year. The experience is one that has left her feeling like she’s in “shiva mode,” wondering what is to come next. At the same time, she says we have to put aside that Jewish part of us that tends toward the cynical. Seeing only negative will not move things forward.